We welcome Newcastle Town to the Skuna Stadium for the first time in 10 years! Well apart from the postponed game in December as the heavens opened late on to ensure the fate of the game (the visitors headed off into Manchester for their Christmas do with our best wishes) and the second postponement in early March as we tentatively watched the officials inspect the pitch in hope rather than expectation. Today’s weather looks much more conducive for football! The Castle won the North West Counties Premier Division in season 2009/10 and have since been plying their trade in the Evo-Stik Division One South where they most recently competed in the end of season play-offs in 2014/15 after finishing in 3rd place. 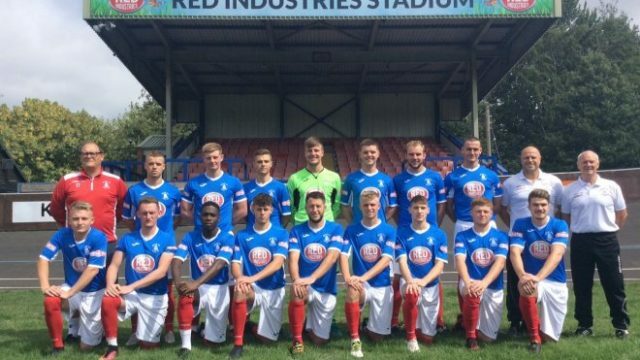 Manager Robin van der Laan strengthened his squad following last season’s 20th place finish in the Division One South by bringing in his son Jack, goalkeeper Matt Johnson from Eccleshall, Taylor Attrell from Alsager Town and Matt Ward from Port Vale. With Attrell and Luke Dennis also having experience with Port Vale, we can expect a technically proficient squad. They currently sit in 15th place in the league and in a decent run of form, losing at the weekend to Runcorn Linnets as Freddie Potter netted a late winner. Last time in this neck of the woods, The Castle took all three points home from league form team Ramsbottom United. A win over our opponents on Saturday Widnes quickly getting a 4-3 defeat to Colwyn Bay out of their system, a game they had led 3-0! After losing last season’s top scorer Aaron Bott to Leek Town, our danger men are former Leek man Mike Conlon who was also on the books of Port Vale previously and striker Jordan Cole who returned to the club in January, netting 4 league goals in March. For Colls, we can expect manager Micheal Clegg to utilise his squad following Saturday’s taxing win over Widnes, the pitch taking its toll on players.